Get ready for ’90s nostalgia, non-grunge edition. While the late Kurt Cobain is being lamented for his disturbed genius in the recent doc Montage of Heck, the era’s other cultural trappings (clothes, music, etc.) are making an equally strong comeback. No more is this more obvious than in Dope, a new dramatic comedy from writer/director Rick Famuyiwa. Perhaps best known for the equally autobiographical effort The Wood, this is a film in love with the hip-hop of two decades past that places its characters in the real world troubles of 2015. And when you consider the current state of race in our country, such backwards glancing is understandable. The film is set in the crime-ridden area of SoCal called The Bottoms. 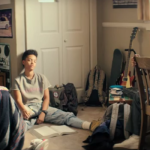 There, Malcolm (Shameik Moore, destined to be a star after this) and his pals Diggy (Kiersey Clemons) and Jib (Tony Revolori) spend their time obsessing on their grades, college, and old school rap like A Tribe Called Quest and Digital Underground. They have their own band, a pathetic punk outfit named Awreeoh (with the songs on the soundtrack provided by Pharrell Williams) and are basically biding their time until they can get into college (Malcolm fancies himself a Harvard man). When a drug dealer named Dom (rapper A$AP Rocky) confronts them, asking Malcolm to invite Nakia (Zoe Kravitz) to his upcoming party, it starts a chain of events which ends up with our leads in possession of a backpack full of ecstasy and a handgun. Suddenly, the realities of the neighborhood they have so stridently tried to avoid start creeping in, including mysterious meetings, unfamiliar moral territories, and perhaps that most frightening of all adolescent issues — the college interview. With SATs and GEDs in the background, our heroes have to try and survive this most complicated of all senior years. Dope drives a hard bargain. It balances the basics of a clever, coming of age comedy with the equally important elements of a (minor) action film. It argues insight while creating artifice in its characters and occasional plot contrivances. It is laugh out loud funny, edge of your seat thrilling, and slightly disappointing, all in one. We would follow Malcolm and his equally eccentric pals even if they didn’t have a bag of Molly to deal with, so the crime element often gets in the way. What does work is the chemistry between the friends, as well as the performances by the actors. Famuyiwa is taking a chance here, offering us nerds as heroes. Luckily, geek culture is now the popular norm, even if this version is more fringe than others (can you name the last major movie character rocking an old school Kid N Play fade?). Besides, Malcolm is no cowardly brainiac. Instead, he functions on instinct as well as smarts, and when the time comes to fight back, he will. Or at least, he will try. There’s a wonderful subtext here, something Famuyima and his film should be proud of. Most movie portraits of people of color are one dimensional and, unfortunately, all inclusive. Put another way, many mainstream movies treat minorities in the same way they did back in the ’30s and ’40s, only with more stealth and less outright intolerance. Here, we get diversity within a single community, something only Tyler Perry tries to accomplish. Mr. Madea makes the dichotomy too wide. Famuyima does a far better job, arguing that outside their unusual interests, Malcolm and his friends might find themselves on Dom’s side of things. It’s more than just a question of standardized testing. It’s a question of community. With its fresh feel, terrific acting, and often pointed takes on our present politics (there is a ongoing discussion about who, exactly, can and cannot use the “N” word), Dope is just that — in the vernacular of the ’90s, that is. It might be too episodic and erratic, but when it gets its groove on, it’s a blast from (and for) the past.